Now that you’ve got your grill out, here’s a juicy burger recipe from the Green City Market cookbook. This one comes from the Sunday Dinner Club, a (somewhat) underground supper club that hosts intimate dinner parties in a home setting featuring seasonal ingredients from the city’s farmers markets. Here’s the Sunday Dinner Club Market Burger. We really deeply love a good burger. Sunday Dinner Club has always served up the foods we crave using the best ingredients we can find. We like our burgers simple, but each component is carefully sourced and handled. Over the years at Green City Market, we’ve made many friends who have sought out a weekly burger from our stand while shopping the Market. One group remains our favorite-all of the farmers who line up at 7 a.m., just as the grill is getting fired up, to order a burger for what might appear to be a hearty breakfast and fuel for the long day. The truth is that these farmers rose at 2 a.m. to drive hours to Chicago for the early morning Market, so really, our hamburgers are their lunch. Cut the top off the head of garlic, place it on a small sheet of foil, and drizzle it with the oil. Wrap the foil around the garlic and bake it for 30 minutes, until soft and golden brown. Squeeze the garlic from the skins and discard the skins. Mash the garlic into a paste. Place the mashed garlic in a small bowl and add the mayonnaise; mix well. Add the lemon juice and season with the salt and black pepper. Stir well. Refrigerate until ready to serve (will keep for up to 4 days). Divide the beef into 6 portions gently shaped into loose balls. Gently press each ball into a patty of the desired thickness, taking care not to overwork the beef. Preheat a charcoal grill with hot coals using lump wood natural charcoal, started using a chimney (and not lighter fluid). Allow the grates to heat up. Place the beef patties on the grill and cook for 2 to 3 minutes on 1 side, until seared. Once the meat releases easily or has a good sear, turn to the other side and cook for 2 minutes, to medium rare (or longer to desired doneness). Remove from the grill. Spread on the tops of the buns. 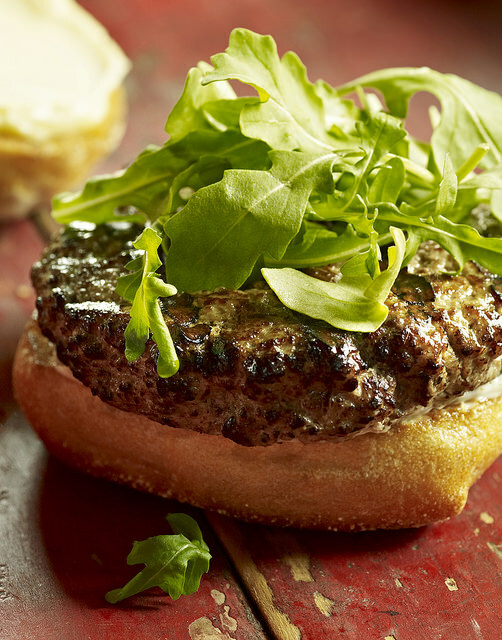 Add the ketchup and mustard, if using, and top the burgers with the arugula. Place the bun tops on the burgers and serve warm. *If you choose to grind your own meat or have a local butcher do the grinding , look for an ideal meat-to-fat ratio of about 80/20, and consider adding short rib or brisket to the mix. Grind the beef fresh the day you are going to serve it. Make sure the beef is super cold, or perhaps even a little frozen, before you grind it. Remove any gristle or silverskin from the beef. Cut the beef into pieces that will fit through your grinder, season it with salt and black pepper, and use a medium die on your grinder to gently push the beef through. Reprinted with permission from The Green City Market Cookbook, Agate Midway, 2014.